Recognize packaged goods such as items in your kitchen or grocery store, organize money, quickly identify a medication bottle, easily find a CD in your music collection, and more! 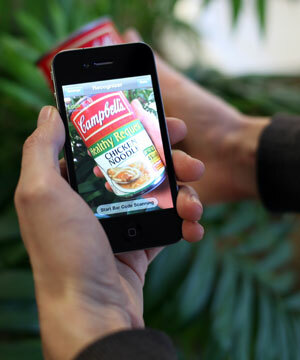 For objects that cannot be recognized using their packaging images, LookTel provides a set of printed and pre-trained image tags that can be applied to virtually any object in your home such as clothing, Tupperware with frozen food or a glass jar. Simply peel and attach the tag to an object, point your mobile phone at it, and record an audible description of the item. Increase your personal mobility and have confidence in your orientation by training the system to recognize destinations such as a home or building entrance. Simply take a photo and label it by speaking into the phone’s microphone. Later, you can use LookTel to confirm that you have reached your own home, friend's apartment, or as many other destinations as you desire. Customize LookTel by teaching it to recognize other items of importance to you. Capture photos of the items and label them with your own speech tags. Then, when LookTel "sees" them again, you will hear your own message about the items you taught it to recognize. This can become a family activity, and with each tag, you gain control over the visual world around you. LookTel provides additional state-of-the-art tools for remotely connecting to another person that can provide a wide range of assistive services to make day-to-day activities easier. Through a combination of live video, hi-resolution photos and GPS tracking data sent from your cell phone, remote assistants can help read signs on street corners and buildings, provide turn-by-turn directions, and use integrated resources such as Google Maps to identify nearby points of interest and help you learn a new neighborhood. With LookTel, the help of a sighted assistant is within pocket reach at all times. Use your mobile phone to take a photo of any printed text and the system will read it back to you. As LookTel sends these images to a server running a full-featured optical character recognition engine, this solution offers a more robust mobile text reader that can handle complex pages of text and skewed or rotated images.